Rachel Khoo was living in London working as a fashion publicist when she decided to move to Paris and earn a degree from the prestigious Cordon Bleu. In her book, Rachel aims to make French cuisine more accessible to us, and the recipes are simple enough to cook even during a busy work week. The first three chapters are my favorites: Everyday Cooking, Snack Time, and Summer Picnics. 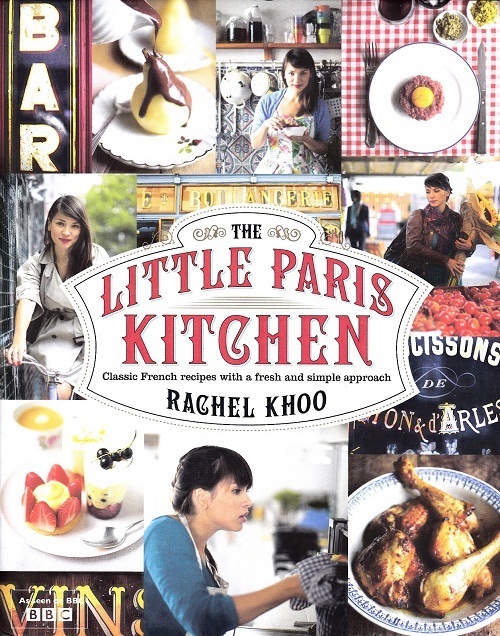 Khoo also includes a very helpful section entitled French Basics where she shares basic recipes, techniques, and pantry items every French Chef Wannabe needs to know. The photography is fantastic in the book, and I especially liked seeing photos of her tiny little kitchen with only two burners and a small oven. I think that's part of the point of this book: you don't need the latest (and largest) gadget to cook basic delicious French food. 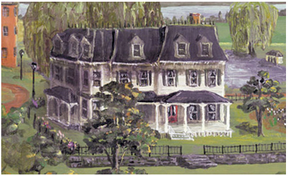 Rachel's tiny French apartment was only large enough to book two diners for lunch daily. People from all over the world wanted to eat simple French home cooking while in Paris, and her little apartment "dining room" was a hit with everyone, even Parisians. 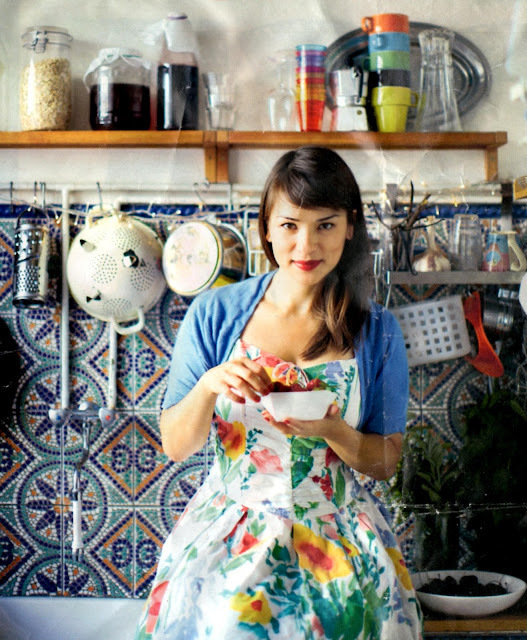 I would love for Rachel Khoo to feed me one day! Sadly, I read on her blog that The Little Paris Kitchen restaurant is no longer open. I appreciate her love of cooking and her simple approach to French food. I highly recommend this cookbook, and it is probably the best one I've read (and tested!) in a few years. I love how Rachel seems to really like red lipstick. She's adorable! Rachel has her own BBC-TV show, but I haven't seen it yet. I'll see if I can find a few episodes on Apple-TV. I've tried several recipes from the book, and one of the most fun recipes was for Coq au Vin cooked with skewers on the grill. How much fun is that!?!? Today I want to share Rachel's recipe for pain perdu avec compote de cerises et basilic from the Snack Time chapter. It was a huge hit for breakfast, although one daughter wanted me to make the recipe without the basil. I preferred the basil as I thought it complemented the cherries perfectly! Pain perdu means lost bread. Place all ingredients into a small heavy saucepan and simmer uncovered for 15 minutes. Stir often to help the sugar dissolve. While the compote is simmering, whisk the egg, milk, and sugar together in a bowl. Place the mixture in a shallow bowl that will fit the bread pieces. Soak the bread for one minute on each side in the egg mixture. Heat the butter in a large frying pan on medium heat. Add the bread and cook for 2 - 3 minutes per side or until golden. Remove the basil from the compote. Serve the pain perdu straight from the pan, with the warm compote spooned over and around it. Leftover compote can be stored in an airtight container in the refrigerator and can be reheated when you want it. 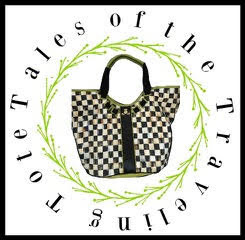 Grab my Literary Friday button from my sidebar, and link-up! That was an AWESOME review. Do you think we could convince her to reopen? That looks deeeeelicious! Thanks so much- I love basil with fruit (or lime...or anything) PLUS it's an aphrodisiac...but I will definitely check out her BBC show and book, thanks! She reminds me of Audrey Hepburn, with the bangs and red lips. Yay! To me cooking at home is like sewing your own clothes. It used to be cheap and easy. Now it is so expensive to go out and cook for one person. I am trying to be better about cooking at home but it is so darn expensive and I can't use all the ingredients before they spoil. I will always say, If I win the lotto one day I can't wait to hire a personal live in chef. Oh yum...you know even though I've read a bunch of your food book reviews I've never thought of reviewing any of my cookbooks. I am heading to the book store this afternoon so I might just have to pick this one up. This looks delicious! I have seen her show once where she even has people come up to eat her at her place. It is very tiny. It sounds like a good book. Maybe I will put them on my wish list from amazon.